Norway’s central bank (Norges Bank) has started warning the public that some of its currency notes that were replaced last year are about to be taken out of circulation. They won’t be valid or accepted as legal tender after May 30. The expiration date applies to the old 100- and 200-kroner bank notes that were the first to be replaced by a series of new currency that began to be introduced last year. Both versions of the 100- and 200-kroner notes were valid for one calendar year, but that runs out at the end of May. 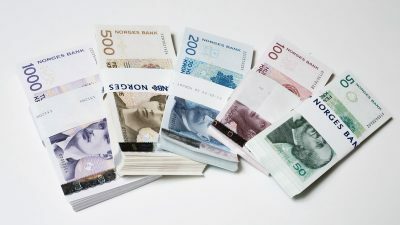 “Our impression is that some banks and merchants show a certain amount of flexibility in connection with the introduction of new currency,” Leif Veggum, director of cash payment instruments at Norges Bank told state broadcaster NRK on Wednesday. “But the safest thing to do is to use up any old 100- and 200-kroner notes, or deposit them in your bank account ahead of the (May 30) deadline,” Veggem said. It’s possible to still receive the old currency notes in change as long as they’re valid, but most merchants and banks have started using only the new currency that came on the market in May 2017. Mostly new notes are also being dispensed by minibanker (automated teller machines) as well. Those left holding the old currency can turn it in to the central bank itself, which also exchanges all Norwegian currency printed after 1948 in return for a fee. Veggum said Norges Bank is legally obligated to exchange the old currency for at least 10 years after May 30, 2018. Major banks including DNB and post offices are also likely to continue to accept the old notes through the end of this year. Norges Bank opted to introduce a new currency series to take advantage of new technology that makes their bank notes more secure and less likely to be subject to counterfeiting. The use of cash has been rapidly declining in Norway, with tax authorities eager to all but do away with it for the sake of transparency. Norges Bank, however, want consumers to be able to decide whether to use cash or bank cards. “As long as there’s demand for bank notes and coins, Norges Bank will make sure they’re available,” the central bank wrote on its website. New 50- and 500-kroner notes will be introduced later this year, with a new 1,000-kroner note due in the last quarter of 2019. 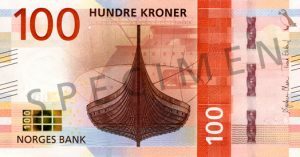 All the new currency reflects Norway’s historic relation with the sea, with the 100- and 200-kroner notes featuring a Viking ship and a codfish respectively. The new 50-kroner notes will feature a lighthouse, the new 500-kroner notes feature an historic search and rescue vessel, and the new 1,000-kroner notes will feature a wave on the open sea, symbolizing how the sea can both pose challenges and propel people forward.